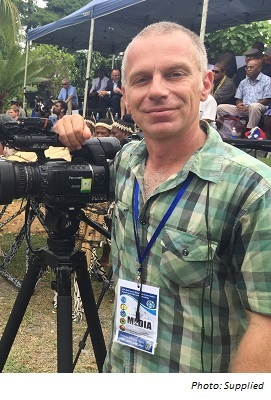 Stefan Armbruster is an award-winning correspondent for SBS World News, where he has covered Queensland and Pacific since 2007. He began his career at Brisbane public radio 4ZZZ, which sparked his interest in Aboriginal and Torres Strait affairs. A ‘journalist attachment’ at the Fiji Broadcasting Commission started his overseas experience, which led to a decade working in London at Dow Jones, CNBC Europe and the BBC. His Twitter handle is @StefArmbruster. Social media and the internet have changed journalism radically. There is now an overwhelming number of information sources and so many ways of distributing stories to audiences. Coverage now means reporting not for one platform but outputting across television (social videos), radio (podcasts) and online platforms simultaneously, requiring production skills for all of them. Great advice I received from a much younger journalist was “everyone is now their own broadcast channel” and to use social media to push out stories. Which influential journalists in the industry have had an impact on your career? There are so many inspiring journalists but two in particular who have acted as mentors. Legendary ABC Pacific correspondent Sean Dorney who blazed a trail through the region for 40 years covering significant stories often ignored or missed by most Australian media. Very early on, my journalism lecturer Peter R Young at Queensland University of Technology (QUT) – ex-SAS, Vietnam veteran and then a journalist – who inspired a whole cohort of students to view the world and media in a different way. A favourite story this year is hard to answer. I’ve covered the Townsville floods and that weather system as it trashed Vanuatu, New Caledonia and the Solomon Islands before returning to Queensland as Cyclone Oma. There was also the coroner’s inquest into the death of an Iranian refugee who set himself on fire on Nauru. Both very strong stories but I’m still looking for a “favourite” for 2019. What role do press releases play for a news correspondent? Press releases are another source of information that goes into the editorial mix. They now compete more than ever with other communication channels in giving journalists a heads up on yarns. If it is being sent by press release the story is out there for all to cover and I’d prefer to get it pitched to me beforehand to generate unique content.